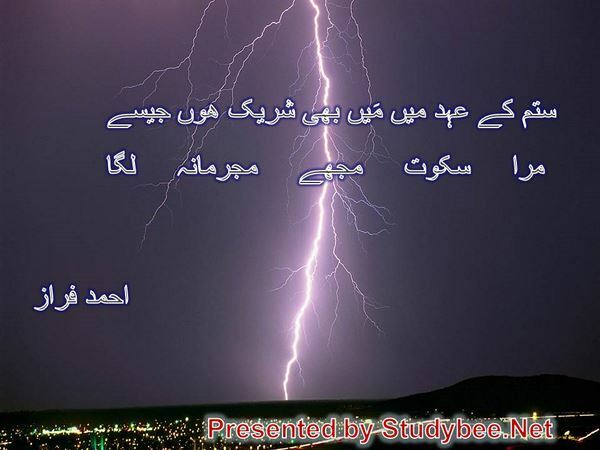 Urdu Political Poetry is generally related to the poets like Allama Muhammad Iqbal, Habib Jalib and Faiz Ahmed Faiz that spoke openly against the tyrants of their times; however, we have ransacked the hidden treasures of Urdu poetry and brought out what there was on offer by different poets. In this case we have selected Ahmed Faraz’ best verses that have political relevance to our country’s present, past and future. It is pertinent to mention here that all of the verses mentioned in this page are not meant for political relativity but most of these are directly related to politic while a few have indirect or implied hints towards the political scenarios and the leaders of our country. Keep enjoying the verses from احمد فراز شاعری and ask us a question or recommend us on the social networks if our work is appreciable and worthy of praise.